Hotel accommodation in the UK to suit all budgets - small cheaper hotels and larger hotels with swimming pools, luxury spa, golf and leisure facilities. The Travellers Guide has a great choice of romantic hotels which make ideal wedding reception venues and family hotels near safe sandy beaches and popular tourist attractions. You can also find UK hotels with great restaurants and business hotels with conference rooms on TTG. The Channel Islands are part of the UK and there a some great family friendly hotels and guest houses on the islands of Jersey and Guernsey. The Isle of Man is also part of the UK and is famous for its TT racing so you may wish to look for hotels there too? Set in 4 acres of attractive gardens, the Knockomie Hotel offers individually-styled rooms, scenic views and an impressive Malt Library, with over 100 Scottish whiskies. Built in 1812, the award-winning Knockomie Hotel also provides free parking and free Wi-Fi. The hotel has facilities for every need, from a wonderful wedding venue to functional meeting rooms. 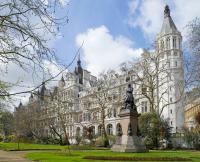 The Royal Horseguards Hotel reflects French chateau style from its stately Westminster location in London, England. This historic property is positioned three blocks from the Houses of Parliament and Big Ben. Hotel Features. This prestigious riverside hotel was constructed in 1884 as a lodging for international diplomats. Overlooking Harvey Nichols, the Sheraton Park Tower is an opulent 16 floor high rise hotel with panoramic views across the capital from one of central London's most exclusive areas, Knightsbridge. The 280 guestrooms are decorated in muted tones with contemporary furniture including leather chairs and Art Deco style light fittings. 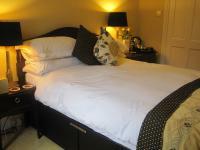 Opposite historic Calton Hill Park, The Hedges offers guest house accommodation and free Wi-Fi. Waverley rail station and Princes Street are a brief walk away. All of the spacious rooms have a plasma-screen TV and sleek en suite bathrooms. The modern Apex International Hotel is opposite 14th century Edinburgh Castle in central Edinburgh, Scotland. The Museum of Scotland, the Royal Mile and Princes Street's shops are within 500 metres. Edinburgh Waverley Station is 700 metres, approximately 10 minutes' walk away. Hotel Features. 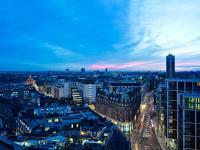 The contemporary Apex International Hotel is flanked by historic buildings on the cobbled street Grassmarket. Located in one of the most beautiful and picturesque settings on the Island. The Sulby Glen Hotel & "Bistro" is a traditional country inn nestling at the foot of the beautiful Sulby Glen, offering uninterrupted views of mountains and glens. Under the watchful eye of resident owners Rosemary and Eddie Christian, you can relax by the open log fire in the Bar or the homely legends Bistro. The Channings Classic Hotel is a charming boutique hotel comprised of four late Victorian terraced townhouses just minutes away from Edinburgh's city centre and the landmark Edinburgh Castle. Located on a cobblestone street, the Channings Hotel is three blocks from the picturesque river, Water of Leith, and is a one half mile from shopping on Princes Street. Set in a historic grey stone building, the Grassmarket Hotel in central Edinburgh, Scotland, is 200 metres from the Royal Mile, Edinburgh Castle and the Museum of Scotland. The four floor hotel is within 800 metres of Holyrood Palace and the Scottish Parliament. Edinburgh Airport (EDI) is six miles away. Hotel Features. Staff at the 24 hour front desk can give tips on sightseeing in Edinburgh. Guestrooms. 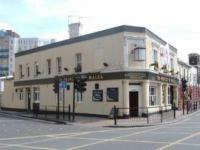 The Princess Of Wales is situated in London's East End. Stratford Station is a 5-minute walk away and has excellent connections to Central London, the O2 and Essex.